The wardrobe providers for Sunday night’s Wimbledon Champions Dinner may need to make a few alterations to accommodate Reilly Opelka’s 6-foot-10 frame, but the unseeded 17-year-old from Florida proved he belonged with the world’s best Sunday, defeating No. 12 seed Mikael Ymer of Sweden 7-6(5), 6-4 to claim the Wimbledon boys singles title. Opelka’s parents and sister had booked their flights back to Palm Coast, Florida for Saturday, and when he was down a match point in the first round, several days of London sightseeing looked more likely for them than attending Sunday’s championship match on Court 1. In Sunday’s final, played under threatening skies that somehow never produced the predicted rain, Opelka’s serve proved to be the difference. Neither player faced a break point in the first set, and Ymer’s defense, including a lob winner over Opelka that drew gasps late in the first set, kept him in every game. When Opelka double faulted to open the tiebreaker, Ymer had his opportunity, but he gave the mini-break back with a double fault of his own. Two aces later, Opelka was up 3-2 and after Ymer held for 3-3, the next point proved the difference in the set. Ymer averaged 12 mph less on his first serve during the match and after an 111 mph first serve, Opelka put away a forehand for 4-3 lead. Although he did not make a first serve in the next two points, Opelka won them both, the first with a great kick serve and the other with a forehand volley winner. Ymer saved two set points on his serve, but Opelka finished with a 132 mph first serve. Ymer returned it, and well, but Opelka was ready for it, putting away a bullet of a forehand to claim the set. Ymer faced his first break point at 1-1 in the second set, but a bad bounce had Opelka swinging and missing on a first serve and Ymer held. Opelka continued to serve well, and at 4-4 Ymer faced two more break points at 15-40. He saved both those and got to game point, but Opelka began cranking forehands, forcing errors that gave him another break point. This time he converted, or rather Ymer capitulated, double faulting to give Opelka an opportunity to serve out the match. Although he failed to make a first serve in the opening three points of the final game, a second serve ace made it 30-15, and a 129 mph ace gave him two match points. Desperately, Ymer challenged both those aces, the 14th and 15th of the match for Opelka, but the calls were confirmed, and on the next point, Ymer sent a backhand wide, securing the championship. With his only celebration a fist pump toward his family and coach Diego Moyano in the Court 1 players box, Opelka removed his cap as he strode to the net for the handshake, a routine he follows regardless of the circumstances. Both Opelka and Ymer saw Opelka’s serve as key to his victory. Ymer, a 16-year-old who trains at the Good To Great Academy in Stockholm, had lost to Opelka at the French Open last month and knew what he would be facing. Hoping to find a way to counteract Opelka’s serve, Ymer was disappointed in that part of his performance. Ymer said he was not as nervous as he expected playing in front of such a large crowd on the famous Court 1, perhaps because he had served as a hitting partner for men’s champion Novak Djokovic the past two days. Ymer was able to see firsthand just how consistent the world No. 1 is. While Ymer, who with his older brother Elias is hoping to revive Swedish tennis fortunes, Opelka has much more company among junior boys in the United States. American boys have won three of the last five junior slams, with Opelka joining 2014 Wimbledon champion Noah Rubin and last month’s French Open champion Tommy Paul on that exclusive list. He is not surprised that major junior titles are now starting to come in bunches. Knowing the level of competition he faces daily from his American peers, perhaps Opelka’s family could be forgiven for scheduling their return before the final. 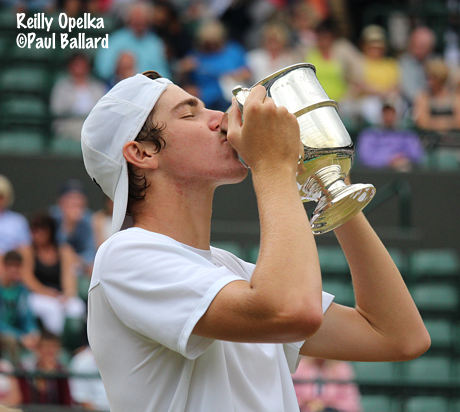 Opelka, who signed with Lagardere management in April and now has an endorsement agreement with New Balance, is planning to play Kalamazoo next month and the US Open Junior Championships in September. Just over two hours after securing the singles title, Opelka returned to Court 1 for the boys doubles final. A few sprinkles prior to the match brought out umbrellas in the crowd, but again there was no interruption of play. No. 4 seeds Opelka and his partner Akira Santillana of Japan fell to No. 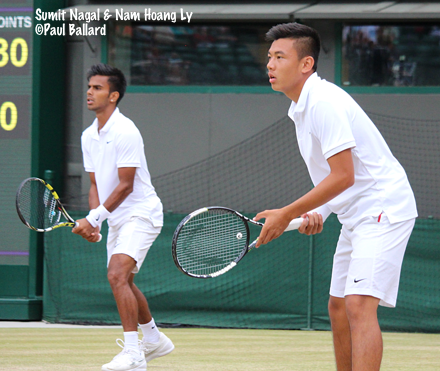 8 seeds Sumit Nagal of India and Nam Hoang Ly of Vietnam 7-6(4), 6-4. Nagal and Ly, who is the first player from Vietnam to win a junior slam title, had never played together before this week. Although Nagal now joins Leander Paes(mixed) and Sania Mirza(women’s) as Indian Wimbledon champions in 2015, he does not consider himself a doubles player now, or in the future. Opelka admitted it was difficult to refocus after the singles. The girls doubles champions are Dalma Galfi and Fanni Stollar of Hungary. The No. 3 seeds defeated unseeded Vera Lapko of Belarus and Tereza Mihalikova of Slovakia 6-3, 6-2. Galfi and Stollar had ended the Grand Slam hopes of top seeds Marketa Vondrousova and Miriam Kolodziejova of the Czech Republic in Saturday’s semifinals 7-6(2), 6-4. Vondrousova and Kolodziejova had won the Australian and French titles. Complete draws can be found at Wimbledon.com. Additional coverage of the boys final is here and at the ITF Junior website.